My Photo Mentor is Up and Running! We have been busy, busy, busy writing articles, making videos, posting galleries and building MyPhotoMentor into the best instructional website out there for amateur and aspiring photographers! Thank you in advance for checking it out, telling us what you think and sharing it with others. 3. You worry about the cost of pursuing your photography passion. What if there was a place where you could gather with people just like you? What if you could learn without feeling anxious about the technical aspects? What if you could pursue your passion in an affordable and fun way? Articles, Forums, Galleries, Critiques, Webinars, One-on-One Mentoring, and most importantly, OURSELVES! Be a Charter Member of My Photo Mentor! We will be looking for you! 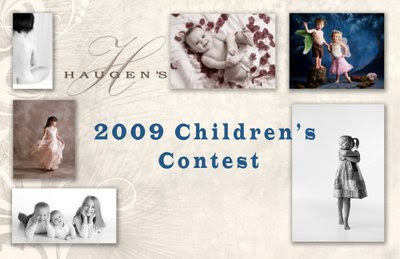 Our children's contest has a whole new look and you're going to LOVE it! The entry fee for the contest is $35 and goes in it's entirety to benefit children in the Mid-Willamette Valley. We support the Boys and Girls Club of Corvallis and Operation Backpack which purchases school supplies for needy school children. You will receive a complimentary 5x7 portrait with your entry. Sign up and get the Top Five Secrets to Ensuring a Great Portait Session of Your Child absolutely free! 1. Schedule your portrait session before March 31 by calling the studio today - (503)838-5416 or 1-800-838-5416. This is when you pay the $35 entry fee. 2. We'll email you the Top Five Secrets to Ensuring a Great Portrait Session of Your Child. 3. Select a background and clothing to match. We don't have a set theme this year, but feel free to be as creative as you want with props and clothing. 4. Arrive at the studio a few minutes early for your session with clothing (and props?) in hand. Don't stress. You will have time to dress your children (or undress them) and fuss with their hair. Let us worry about everything else! Get directions from Corvallis or Salem. 5. Schedule a selection appointment for a week after the session. This is very important. Without this appointment, you will not be eligible for the contest. This is when you will select an image to be entered in the contest and the images you want for yourself. 6. Voting. After you have decided on your entry, we will post the image here on our blog, along with some fun facts about your child (fav toy, food, activity). We will send you an email with the link and then it is time to VOTE, VOTE, VOTE! Each unique comment left about your entry is counted as a vote. So, get your friends to comment, get your family to comment, get everyone you know to comment!! The portrait with the most unique comments will win the contest and a 24" Wall Portrait valued at over $700! Voting will end on April 10th, with the winner announced shortly after. What if I need to reschedule? We ask for a minimum of three days notice for rescheduling sessions or selection appointments so that time can be made available to other people. If your child wakes up sick on the day of the session, we will allow you to reschedule. Your selection appointment must take place within two weeks of the portrait session in order to be eligible for the contest and the special contest pricing.